This overgrowth can be recognized by its greenish or yellow-brown color, (while whitish or gray filamentous masses, made up of bacteria and fungi, may also be mixed in with algae). This type of growth can form quite thick layers on the glass panes, the bed, and the decor, appearing as filamentous tufts or even completely covering other green algae. While a modest presence of algae can be considered a sign of equilibrium, this overgrowth is evidence of a degree of imbalance, and so algae are often referred to as biological indicators. You must be careful, however, as every aquarium is a special case, and applying a generalization to a specific situation could ultimately lead to the wrong conclusions. If due care is not taken, microalgae can rapidly cover the decor and panes of an aquarium. This does not necessarily have a negative effect on the fish, but the visual effect is seriously undermined. Apart from being an eyesore, excess algae grow on the panes, reducing the visibility. They attach themselves to plants and proliferate, with the subsequent risk of suffocating their hosts, as the plants are prevented from exchanging gases and absorbing the salts in the water. Finally, they incrust themselves on the slightest details in the decor, which does nothing to enhance the visual effect. These are substantial. Algae consume nitrogenous substances, particularly nitrates, and sometimes ammonia. This is the normal role of plants in fresh water, and algae can therefore complement this action or, on the contrary, exert an antagonistic effect by diverting nutritious salts away from the plants. The vegetation is less abundant in marine tanks, and so algae - particularly the filamentous green ones - can play an important role. Algae can also be grazed or ground by some fish. In fresh water, this applies to the Poeciliids and the species known as "suckers" or "washers" (Gyrinocbeilus, Ancistrus, Hypostomus, Panaque, Otoclinchus, Epalzeorbynchus). 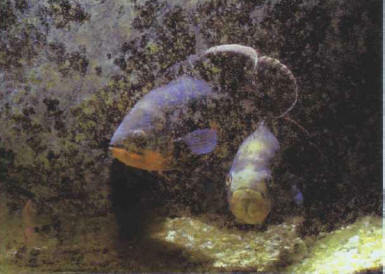 In sea water, algae form part of the diet of fish families, such as the Chaetontids, Centropyges, and Acanthurids; their presence in an aquarium can help these fish acclimatize themselves to the artificial environment of the domestic aquarium.